Comprised of 20 museums, historic houses, parks, forts and other attractions on the Groton and New London sides of the Thames River, the park connects the various independent sites through a common organization with a website, guides and water taxi to tell the story of 400 years of history. A state park without boundaries, it includes national sites such as the Submarine Force Museum and the Coast Guard Academy as well as Revolutionary War-era homes and battlegrounds and cultural attractions such as the Garde Arts Center and Lyman Allyn Museum. Among the stakeholder organizations, Connecticut Sea Grant is unique as the only one focusing on the coastal environment, supporting research and a healthy marine economy. The Stakeholder Agreement between Sea Grant and the park was approved by the park’s Board of Directors this fall. 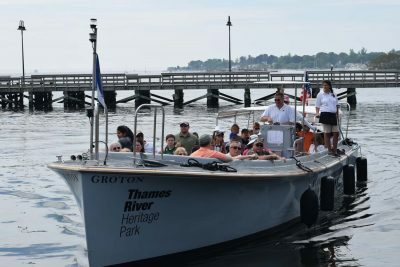 The Thames River Heritage Park water taxis were filled with passengers participating in the Quest hikes on Connecticut Trails Day in June. Under the Stakeholder Agreement, Sea Grant will participate in park planning, events and initiatives, share information about events and provide links to the park website on its homepage. Judy Benson, communications coordinator at Sea Grant, joined the park board this summer for a three-year term. The partnership agreement came about after Sea Grant and the park successfully collaborated on three Thames River Quest hikes on Connecticut Trails Day last June that drew more than 150 participants. Amy Perry, executive director of the park, said the addition of Sea Grant as a Stakeholder will allow both organizations to broaden their outreach and support each other’s missions. Marian Galbraith, president of the park’s board, said Sea Grant and the heritage park have complementary missions. This entry was posted in News and tagged 2018, Coastal Resources, Long Island Sound, Sea Grant, Thames River, Thames River Heritage Park.